Yes, it’s official. I’m settling on the term γραμματημερολογιον grammatēmerologion as the official term for the lunisolar grammatomantic calendar, including its chronological ritual use to schedule magical rites and festivals. Long story short, this is a lunisolar calendar that maintains the lunar synodic months of 29 or 30 days in a particular cycle of either 12 or 13 months for every year to keep track with the seasons and the solar year. What makes this different is that the days of the lunar month, as well as the months and the years themselves, are attributed to the letters of the Greek alphabet, hence grammatomantic for their ritual and occult significations. If for some reason, dear reader, you don’t know what I’m talking about yet, go read through those two posts I just linked and learn more. At its core, the major use of the Grammatēmerologion system is to keep track of monthly ritual days. Of the 29 or 30 days in a lunar month, 24 are attributed to the 24 letters of the Greek alphabet; three are attributed to the obsolete letters of the Greek alphabet that were phased out (Digamma, Qoppa, and Sampi); and the other two or three are simply unlettered days. 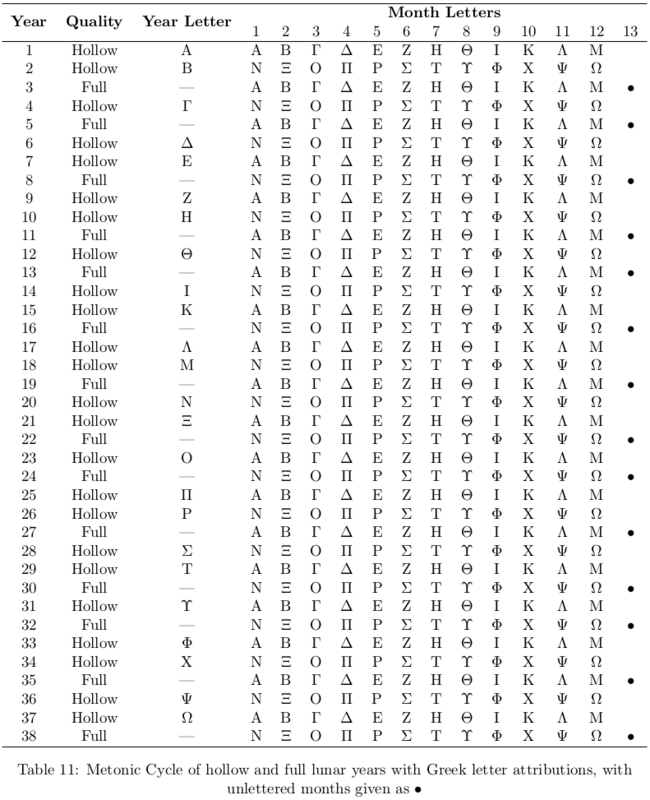 Each of the 24 letters of the Greek alphabet is associated with a particular elemental, planetary, or zodiacal force according to the rules of stoicheia, and by those associations to one or more of the old gods, daimones, and spirits of the ancient Greeks. Thus, consider the second day of the lunar month; this day is given the letter Beta. Beta is associated with the zodiacal sign Aries, and by it to the goddess Athena and her handmaiden Nike. Thus, scheduling sacrifices and worship to Athena and her attendant spirits on this day is appropriate. The rest goes for the other days that are associated to the 24 letters of the Greek alphabet. The three days given to the obsolete letters are given to the ancestral spirits of one’s family and kin (Digamma), one’s traditions and professions (Qoppa), and to culture heroes and the forgotten dead (Sampi). The unlettered days have no ritual prescribed or suggested for them, and the best thing one can do is to clean up one’s house and shrines, carry out one’s chores, and generally rest. Given a calendar or a heads-up of what day is what, that’s all most people will ever need to know about the Grammatēmerologion system. Anything more is for the mathematicians and calendarists to figure out, although there are a few things that the others should be aware of. For instance, there’s the problem of figuring out what months have 30 days (full months) and what months have 29 days (hollow months). Add to it, in order to maintain a link between the lunar months and the solar year, we need to figure out which years need 13 months (full years) instead of the usual 12 (hollow years). There’s a method to the madness here, and that method is called the Metonic cycle. The cycle in question was developed by the Athenian astronomer Meton in the 5th century BCE, and he calculated that 19 solar years is nearly equal to within a few hours to 235 synodic months of the Moon. Meton prescribes that for every 19 solar years, 12 of them should contain 12 synodic months and seven should contain 13; there should be a full year of 13 months after every two or three hollow years of 12 months. Likewise, to keep the lunar month fixed to the actual phases of the Moon, a hollow month of 29 days should follow either one or two full months of 30 days. Now, I won’t go into all the specifics here about exactly what month in what year of the Metonic cycle has 29 or 30 days or the gradual error that accumulates due to the Metonic cycle; that’ll be reserved for another text and another time. Suffice it to say that Meton was very thorough in developing his system of 19 years and 235 months, figuring out when and where we should add or remove a day or a month here or there, and I’ve used his system in developing a program that calculates what the lunar date is of any given Gregorian calendar date. (If you’re interested, email me and I’ll send you the Python code for private use only.) If you want to read more about the specifics of the Metonic cycle developed and employed in ancient Greece, along with other calendrical schemes that the Metonic cycle was based on and influenced later on, I invite you to browse the six-volume work Origines Kalendariæ Hellenicæ by Edward Greswell from the 1860s (volumes one, two, three, four, five, and six). Yes, this is a nasty endeavor, but hey, I did it, so you can too. So, let’s take for granted that we have the Metonic cycle of hollow and full months and hollow and full years. We have a cycle of 19 years that repeats; cool! The problem is, where do we start the cycle? Without having a start-point for our Metonic cycle, we don’t have a way of figuring out which year is which in the Metonic cycle. In the post where I introduced the lunisolar grammatomantic calendar, I sidestepped this by using the same cycles as another lunisolar calendar that makes use of a system similar to (but isn’t exactly) the Metonic cycle, that of the Hebrew calendar. However, after researching the differences between the two, I decided to go full-Meton, but that requires a start date. This start date, formally called an epoch, would be the inaugural date from which we can count these 19-year cycles. The question then becomes, what should that start date be? The New Moon, the day just before the Noumenia, occurred directly on the summer solstice. The summer solstice coincided with a total solar eclipse over Greece. This was the first year after the legislative reform of Solon of Athens in 594 BCE where the Noumenia coincided with the summer solstice so closely. Thus, our first cycle of the Grammatēmerologion system begins on June 29, 576 BCE. That date is considered the inaugural date of this calendrical system, and although we can track what the letters of the days, months, and years were before that, I’ve chosen that date to count all further dates from in the future. Still, there’s a bit of a caveat here. Recall that, in a 19-year cycle, there are 12 years with 12 months and seven years with 13. 12 is a nice number, but for the purposes of working with the Greek alphabet, we like the number 24 better. Thus, instead of using a single Metonic cycle of 19 years, a grammatemerological cycle is defined as two Metonic cycles, i.e. 38 years. Thus, in 38 years, there will be 24 hollow years and 14 full years. At last, we can start assigning the Greek letters to periods longer than a day! The 24 hollow years are the ones that have Greek letters, and these are given in order that they’re encountered in the grammatemerological cycle; the 14 full years, being anomalous, are left unlettered. The only thing left now is to assign the letters to the months themselves. In a year, we have either 12 or 13 synodic months, and that 13th month only occurs 14 times in a period of 38 years; we’ll make those our unlettered months. Now, again, within a year, we only have 12 months, and we have 24 Greek letters to assign. The method I choose to use here is to assign the 24 letters of the Greek alphabet to the 24 months in two successive years. That means that, in the cycle of 38 years, the odd-numbered years will have month letters Α through Μ, and the even-numbered years will have month letters Ν through Ω. This doesn’t mean that we’re redefining a year to be 24 (or 25) months, but that our cycle of associating the letters of the Greek alphabet makes use of two years instead of just one. This is only cleanly possible with a dual Metonic cycle of 38 years, since a single Metonic cycle of 19 years would have both that final 19th year and the next initial first year both have month letters Α through Μ. If you’re confused about the resulting system, I got your back. Below are two charts I had already typed up (but really don’t wanna transcribe into HTML tables, although it feels awkward to take screenshots of LaTeX tables) that describe the complete system. 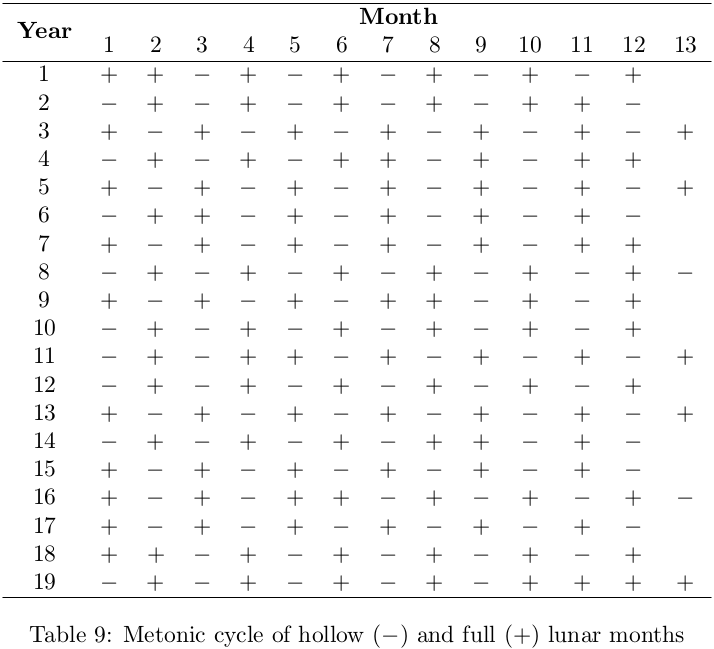 The first table shows what months are full and hollow within a single Metonic cycle of 19 years. The second table shows what years and months within a dual Metonic cycle of 38 years get what letters. Like I mentioned before, this is getting really in-depth into the mechanical details of a system that virtually nobody will care about, even if they find the actual monthly calendar useful in their own work. Then again, I’m one of those people who get entranced by details and mathematical rigor, so of course I went through and puzzled this all together. Ritually speaking, since we ascribe particular days to particular forces or divinities, we can now do the same for whole months and years, though with perhaps less significance or circumstance. However, these details also yield an interesting side-effect to the Grammatēmerologion system that can be ritually and magically exploited: that of Μεγαλημεραι (Megalēmerai, “Great Days”) and Μεγιστημεραι (Megistēmerai, “Greatest Days”). Because the day, month, and year of a given grammatemerological date each have a given letter, it’s possible for those letters to coincide so that the same letter appears more than once in the date. So, for instance, on our epoch date of June 29, 576 BCE, this was the first day of the first month of the first year in a grammatemerological cycle; the letter of the day, month, and year are all Α. In the second day of the second month of the first year, the letters of the day and month are both Β and the letter of the year is Α. These are examples of a megistēmera and a megalēmera, respectively. A megalēmera or “Great Day” occurs when the letters of the day and the month are the same with a differing letter of the year. A megalēmera occurs in every month that itself has a letter, so not in those 13th intercalary months in full years. Because it takes two years to cycle through all 24 month letters, a particular megalēmera occurs once per letter every two years. A megistēmera or “Greatest Day” occurs when the letters of the day, month, and year are all the same. A megistēmera can only occur in years and months that themselves have letters, so megistēmerai cannot occur in full years. A particular megistēmera occurs once per letter every 38 years, but not all letters have megistēmerai. Only the ten letters Α, Ε, Ζ, Κ, Λ, Ν, Ρ, Σ, Χ, and Ψ can receive megistēmerai due to the correspondence between the letters of the year and the letters of the month based on whether the year is odd or even. In a sense, these are like those memes that celebrate such odd Gregorian calendrical notations such as 01/01/01 (January 1, 1901 or 2001) or 11/11/11 (November 11, 1911 or 2011). However, we can use these particular dates as “superdays” on which any particular action, ritual, offering, or festival will have extra power, especially on the comparatively rare megistēmerai. These days are powerful, with the force and god behind the letter of the day itself extra-potent and extra-important, and should be celebrated accordingly. It’s similar to how the system of planetary days and hours work: yes, a planetary hour is powerful, and a planetary day is also powerful, and if you sync them up so that you time something to a day and hour ruled by the same planet, you get even more power out of that window of time than you would otherwise. However, megalēmerai are comparatively common, with 12 happening every year, compared to megistēmerai, which might happen once every few years. Consider the next megistēmera that we have, which falls on October 17, 2015. In 2015, we find that June 17 marks the start of the new grammatemerological year; yes, I know that this falls before the summer solstice on June 21, but that’s what happens with lunar months that fall short of a clean twelfth of the year, and hence the need for intercalary months every so often. The year that starts in 2015 is year 7 of the 69th cycle since the epoch date of June 29, 576 BCE. According to our charts above, the seventh year of the grammatemerological cycle is given the letter Ε. Since this is an odd-numbered year in the cycle, we know that our months will have letters Α through Μ, which includes Ε. The letter Ε is given to the fifth month of the year, which begins on October 13. We also know that the letter Ε is given to the fifth day of the month. Thus, on October 17, 2015, the letter of the day will be Ε, the letter of the month will be Ε, and the letter of the year will be Ε. Since all three letters are the same, this qualifies this day as a Megistēmera of Epsilon. This letter, as we know from stoicheia, is associated with the planetary force of Mercury, making this an exceptionally awesome and potent day to perform works, acts, and rituals under Mercury according to the Grammatēmerologion system. The following Megistēmera will be that of Zeta on November 25, 2017, making it an exceptionally powerful day for Hermes as a great generational day of celebration, sacrifice, and honor. As noted before, only the ten letters Α, Ε, Ζ, Κ, Λ, Ν, Ρ, Σ, Χ, and Ψ can receive megistēmerai. To see why Β cannot receive a megistēmerai, note that Β is assigned to the second year in the 38-year grammatemerological cycle. Even-numbered years have months lettered Ν through Ω, and the letter Β is not among them. This is a consequence of having the months be given letters in a 24-month cycle that spreads across two years. We could sidestep this by having each month be given two letters, such as the first month having letters Α and Ν, the second month Β and Ξ, and so forth, but that complicates the system and makes it less clean. Every letter receives two megalēmerai per grammatemerological cycle, but only these specified ten letters can receive megistēmerai; whether this has any occult significance, especially considering their number and what they mean by stoicheia, is something I’ve yet to fully explore. So there you have it: a fuller explanation of the lunisolar grammatomantic calendar, known as the Grammatēmerologion system, to a depth you probably had no desire to investigate but by which you are now enriched all the same. It’s always the simple concepts that create the most complicated models, innit? I have absolutely no idea what you’re talking about. I never do anything like that. Given the context I developed it for, my Metonic start point is when the dark moon occurs on the winter solstice. Which happens in about a week and a half. If your Metonic cycle starts in a few weeks, then, so you’ll be timing the progression of hollow and full months starting for the next 19 years starting from this coming New Moon? I don’t distinguish hollow vs. full months, as I only specify six lunar phases, rather than the individual days you’re working with. Ah, okay, I see where you’re coming from. The Metonic cycle is used for both hollow/full years as well as hollow/full months; I temporarily forgot about the former for a bit.